NOD.H2h4 mice spontaneously develop autoimmune lymphocytic thyroiditis that mimics human Hashimoto’s thyroiditis, a disease where iodine, IFN-γ, and adhesion molecules have all been implicated in the pathogenesis. To study how iodine and IFN-γ modulate the expression of ICAM-1, we analyzed NOD.H2h4 thyrocytes in baseline conditions (day 0) and at several time points following supplementation of iodine in the drinking water. On day 0, a small percentage (∼10%) of thyrocytes constitutively expressed ICAM-1. The expression gradually increased to 13, 25, and 41% on days 7, 14 and 28, respectively, returning to baseline (9%) on day 35. The initial ICAM-1 kinetics was paralleled by thyroidal infiltration of CD45+ hemopoietic cells, which increased from an average of 4% on day 0 to an average of 13, 21, and 24% on days 14, 28, and 35, respectively. To distinguish whether the observed ICAM-1 increase was a direct effect of iodine or a consequence of the immune infiltrate, we treated mouse primary thyrocyte cultures with 0.01 mM sodium iodine and showed a 3-fold increased ICAM-1 expression. 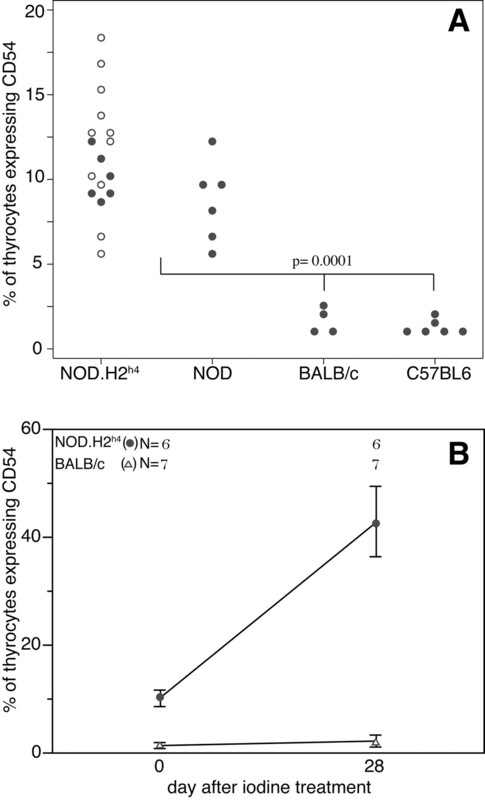 To assess interaction between IFN-γ and iodine, we analyzed CD45 and ICAM-1expression on thyrocytes from NOD.H2h4 wild-type and NOD.H2h4 thyr-IFN-γ transgenic littermates. Strikingly, IFN-γ interacted synergistically with iodine to enhance ICAM-1 expression on thyrocytes. These findings suggest that iodine and IFN-γ cooperate to promote thyroidal expression of ICAM-1 in this mouse model of thyroiditis, highlighting the complex interplay present in the pathogenesis of Hashimoto’s thyroiditis. Autoimmune thyroiditis (AT),3 the third most common autoimmune disease in the United States, is characterized by lymphocytic infiltration of the thyroid gland along with development of thyroid-specific autoantibodies and primary hypothyroidism (1, 2, 3). Like many other autoimmune diseases, numerous factors have been involved in disease pathogenesis, both in the environment and the host. Mechanistic studies, however, are difficult to perform in humans and can be facilitated by the use of animal models. Among these, the NOD.H2h4 mouse has provided fresh insights into disease pathogenesis. NOD.H2h4 mice express the MHC haplotype H-2k on the NOD background and develop spontaneously AT at a low incidence (4). Incidence can be increased by supplementation of iodine in the diet (5, 6, 7). Iodine is one of the best-characterized environmental factors associated with AT. Epidemiological studies have shown that AT incidence has increased following the introduction of salt iodination in the 1920s (8, 9); in addition, AT patients can improve upon iodine restriction (10, 11, 12, 13). We have previously shown that iodine enhances thyroglobulin recognition by autoreactive T cells (14). The mechanisms behind this well-established association, however, remain as yet unknown. Infiltrating lymphocytes damage the target organ by several mechanisms, including production of numerous inflammatory cytokines, such as IFN-γ. IFN-γ was originally considered the disease-promoting cytokine par excellence. In fact, it induces Th1 development, macrophage activation, and up-regulation of MHC molecules and vascular adhesion molecules. In addition, immunohistochemical studies in human (15) or murine thyroids (7) described IFN-γ-producing lymphocytes adjacent to thyrocytes. Recent studies, however, have shown a previously unsuspected role of IFN-γ in the homeostatic control of T cells, with disease-suppressing activities. We have reported transgenic mice expressing IFN-γ specifically in the thyroid; transgenic mice do not develop spontaneous thyroiditis (only minimal lymphocytic infiltration) (16), and are more resistant to the induction of experimental autoimmune thyroiditis (17). This finding has been confirmed in other disease models. Afanasyeva et al. (18) have shown that IFN-γ protects from disease in experimental autoimmune myocarditis, and Tarbell et al. (19) have shown a similar phenomenon in type 1 diabetes. Iodine and IFN-γ have both been known to influence the expression of vascular adhesion molecules, such as ICAM-1. ICAM-1 is a member of the Ig gene superfamily, present on the surface of various cell types, including APCs, epithelial and endothelial cells, and activated lymphocytes (20, 21). ICAM-1, which serves as a ligand for LFA-1, can be induced by various stimuli, such as cytokines, hormones, cellular stresses, and other environmental factors (22). Upon up-regulation, it promotes cell-cell interactions, providing intense signals to the immune system and initiating homing of T cells to the inflamed site. In NOD.H2h4 mice, we have shown by morphology that exposure to iodine increased the expression of ICAM-1, which is already expressed constitutively on thyrocytes before mononuclear cell infiltration (23). In patients with autoimmune thyroid diseases, ICAM-1 has also been reported on thyrocytes (21). In this study, we used the NOD.H2h4 model to investigate how iodine and IFN-γ, two critical factors in the pathogenesis of AT, influence ICAM-1 expression by thyroid follicular cells. This study included a total of 140 mice distributed according to the strain as follows: NOD.H2h4 (n = 110) mice derived from breeders originally provided by Dr. L. Wicker (Merck Pharmaceutical Laboratories, Rahway, NJ), NOD (n = 6), BALB/c (n = 18), and C57BL6 (n = 6) purchased from The Jackson Laboratory. The NOD.H2h4 strain was developed by backcrossing NOD to B10.A (4R) (4), which possesses the thyroiditis-susceptible I-Ak allele (24). Both males and females develop thyroiditis in this strain (6, 7). Mice were maintained in conventional (n = 129) or specific pathogen-free (n = 11) housing facilities of the Johns Hopkins School of Medicine. Of the NOD.H2h4 mice, 81 were wild type and 29 derived from a cross with our previously reported thyr-IFN-γ transgenics (17) (backcrossed for at least eight generations). All protocols were performed under guidelines of the Animal Care and Use Committee. When 6–8 wk old, experimental mice were fed 0.15% sodium iodine (NaI) solution in the drinking water for 7, 14, 28, or 35 days. Age-matched control NOD-H2h4 mice received plain water. At the time of sacrifice, thyroid glands were removed and single-cell suspensions were prepared from individual mice using the method previously described (25). Briefly, the two thyroid lobes were gently minced into fine pieces and added to a sterile microcentrifuge tube containing 0.25 ml of ice-cold DMEM (Invitrogen Life Technologies). This buffer was supplemented with 1.2 U/ml dispase II (Rosh B&M), and 1 U/ml collagenase I (Sigma-Aldrich). Digestion was performed by incubating the tubes in a 37°C water bath for 20 min, with occasional shaking. Cells were released by gentle pipetting, washed two times with 1 ml of staining buffer (1% FBS in PBS in 0.05% sodium azide; BD Pharmingen), and centrifuged at 300 × g for 10 min at 4°C. After a 10-min Fc block, cells were stained for 30 min at 4°C with the following fluorochrome-conjugated mouse mAbs (all from BD Pharmingen): CD45 (PerCP) to identify hemopoietic cells; CD34 (FITC) for endothelial cells; and CD54 (PE) for ICAM-1. The cells were washed three times after staining and resuspended in staining buffer. Data acquisition and analysis were performed on a FACSCalibur flow cytometer (BD Biosciences) using side scatter vs CD45 display to gate the thyrocytes (CD45-negative population) or the infiltrating hemopoietic cells (CD45-positive population). For in vitro experiments, aseptically prepared thyrocytes, from glands digested as described above, were pooled from five 6- to 8-wk-old NOD.H2h4 mice and added into 24-well plates and cultured in F12 medium as previously described (26). NaI (0.01 mM) or control PBS was then immediately added to the culture supernatant. After a 24-h incubation, cells were collected, stained for CD54, and analyzed by flow cytometry. The outcome measures analyzed in this study were expression of CD54 and CD45 by mouse thyroid cells. The covariates influencing these outcomes were time of iodine exposure, housing conditions (conventional vs specific pathogen free), mouse strain (NOD.H2h4, NOD, BALB/c, and C57BL6), and genotype (NOD.H2h4 wild type vs NOD.H2h4 thyr-IFN-γ transgenic). To assess the effect of iodine supplementation (days 0, 7, 14, 28, and 35) on expression of ICAM-1 or CD45, we used multiple linear regression, with “time of iodine exposure” treated as a dummy variable using day 0 chosen as the reference category. To assess differences in ICAM-1 expression at baseline (day 0) conditions among the various strains, we used ANOVA, followed by the Bonferroni post hoc test for pairwise comparisons. To assess how IFN-γ (transgenics vs wild type) and iodine (iodine fed and noniodine fed) influence ICAM-1 expression, we used multiple linear regression that included an interaction term for the genotype × iodine product. We have previously shown that CD45, a pan-hemopoietic marker, is very useful to distinguish resident parenchymal cells (such as thyrocytes) from infiltrating hemopoietic cells (such as lymphocytes) (25). We now used this approach to quantitate the accumulation of infiltrating hemopoietic cells into the thyroid upon administration of iodine, and to assess the expression of ICAM-1 on the CD45-negative thyrocyte population. 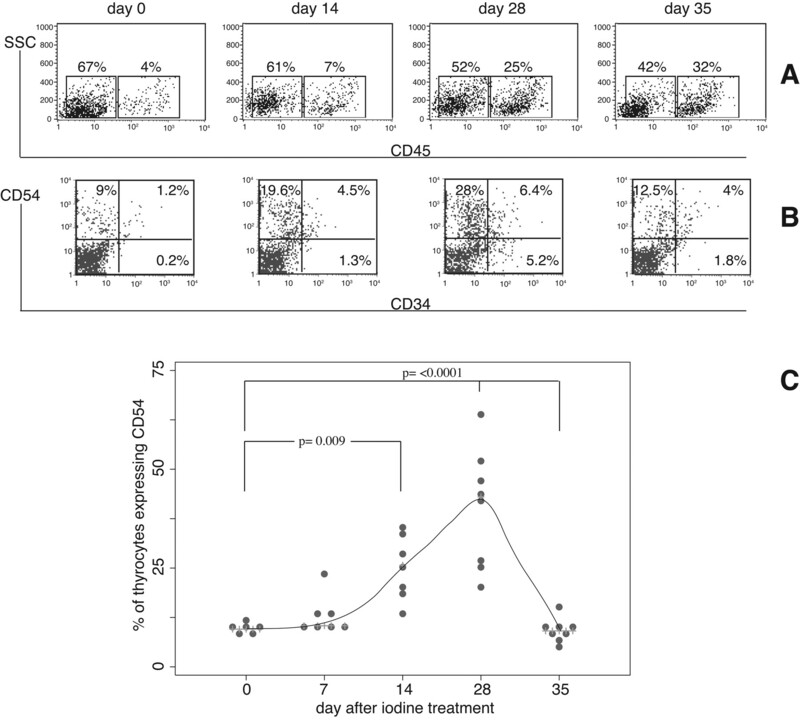 At 6 wk of age, NOD.H2h4 mice not receiving supplemental iodine in their drinking water showed a distinct but minimal (4%) CD45+ hemopoietic cell population (Fig. 1⇓, A and C). After 14, 28, or 35 days of 0.15% iodine, the infiltration increased significantly to an average of 13, 21, and 24%, respectively. A representative mouse from each time point is shown in Fig. 1⇓A. Iodine increases ICAM-1 expression on thyrocytes. Single-cell suspensions were prepared from the thyroids of individual mice under basal conditions (day 0) and after 14, 28, or 35 days of 0.15% NaI treatment. Cells were stained with FITC-labeled anti-CD34, PE-labeled anti-CD54, and PerCP-labeled anti-CD45 and analyzed by flow cytometry. 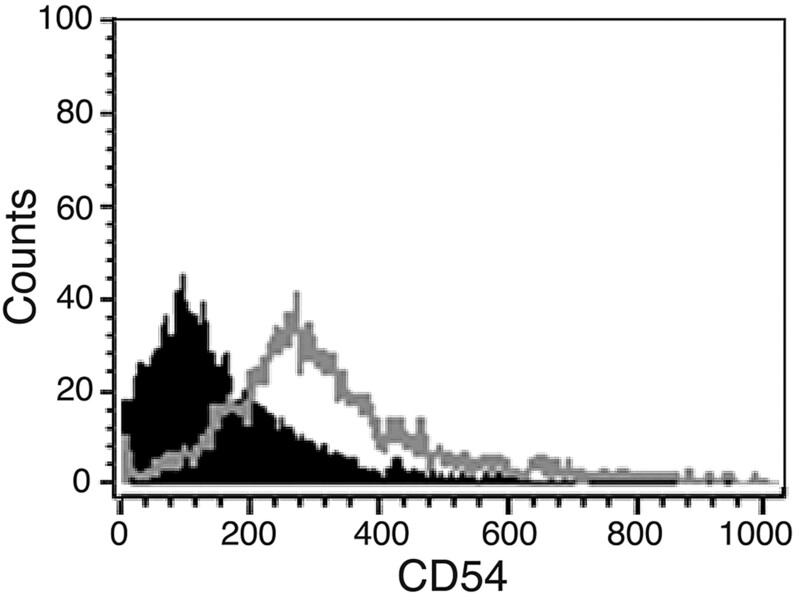 A, Side scatter vs CD45 plots separate the CD45− thyrocyte population from the CD45+-infiltrating hemopoietic cells. Infiltrating cells accumulate in the thyroid upon iodine supplementation. B, Cells from the thyrocyte gate were then displayed for the expression of CD34 (an endothelial marker) and CD54 (ICAM-1). Single-positive ICAM-1 thyrocytes were present at baseline (9%), increased (28%) on day 28, and returned to baseline (12%) on day 35. C, Kinetics of ICAM-1 expression on thyrocytes using a larger sample size and more time points. A line drawn through the median percentages of ICAM-1 expressing thyrocytes show ICAM-1 expression was similar to baseline after 7 days of iodine, increased significantly after 14 days, peaked after 28 days, and returned to baseline after 35 days. We next examined the CD45-negative thyrocytes for the expression of CD54 to identify ICAM-1-expressing cells and CD34 to take into account endothelial cell contaminants. ICAM-1 was already clearly expressed by ∼10% of the thyrocytes in baseline (day 0) conditions (Fig. 1⇑B, left panel, upper left quadrant) and increased to an average of 20 and 28% after 14 and 28 days of iodine supplementation, respectively (Fig. 1⇑B, middle panels). The percentage of ICAM-1-positive thyrocytes then decreased to 12% on day 35 (Fig. 1⇑B, right panel). Endothelial cell contamination was low overall, ranging from 1 to 6% (Fig. 1⇑B, upper right quadrants). To confirm this observation and obtain more insights into the kinetics of the phenomenon, we repeated the experiment on a larger cohort of NOD.H2h4 mice that were sacrificed 7, 14, 28, or 35 days after the start of iodine supplementation. As indicated in Fig. 1⇑C, ICAM-1 expression on thyrocytes increased significantly, reaching a peak on day 28, and returned to baseline levels on day 35. Regression analysis showed that, as compared with day 0, the mean percentage of ICAM-1-positive thyrocytes was not different on day 7 (p = 0.522), became significant on day 14 (p = 0.009), peaked on day 28 (p < 0.0001), and returned to baseline values on day 35 (p = 0.869). Postregression Wald tests showed that the mean ICAM-1 percentage on day 28 was significantly greater than that on day 14 (p = 0.016) and day 35 (p < 0.0001). We next asked whether the increased expression of ICAM-1 on NOD.H2h4 thyrocytes was seen in other mouse strains and whether it was influenced by the environment where mice were housed. Using the same experimental approach (assessment of CD54 positivity among the CD45-negative cells), we analyzed thyroid preparations from NOD.H2h4 housed in specific pathogen-free facilities and from NOD-H2h4, NOD, BALB/c, and C56BL6 mice housed in conventional facilities. ANOVA showed that the mean ICAM-1 expression was significantly different among the four strains (p < 0.0001). Post hoc pairwise comparisons revealed that thyrocytes from NOD.H2h4 mice and from the parental NOD strain expressed significantly higher levels of ICAM-1 than thyrocytes from BALB/c (p = 0.0001) or C57BL6 (p = 0.0001) mice. There was no difference between NOD.H2h4 and parental NOD (p = 0.209). Housing conditions did not make a difference because ICAM-1 was equally increased in NOD.H2h4 kept in specific pathogen-free or conventional facilities (Fig. 2⇓A, left group, comparing ○ to •, p = 0.132 by Wilcoxon’s sign rank test). In addition, supplementation of iodine to the BALB/c strain did not affect ICAM-1 expression by thyrocytes (Fig. 2⇓B, p = 0.1 by sign rank test comparing day 0 vs day 28). Taken together, these in vivo results indicate that NOD.H2h4 mice and their parental NOD strain display a constitutively high expression of ICAM-1 on thyroid cells. Comparison of ICAM-1 expression on the thyrocytes from different mouse strains. A, Thyrocytes from 6-wk-old NOD.H2h4 or NOD mice expressed at baseline significantly higher levels of ICAM-1 as compared with thyrocytes from age-matched BALB/c or C57B/6 mice. Housing conditions did not affect ICAM-1 expression, as indicated by the fact that NOD.H2h4 kept in conventional facilities (left group, •) had similar levels to NOD.H2h4 kept in specific pathogen-free facilities. B, Administration of iodine was not capable of increasing baselines ICAM-1 expression in BALB/c mice, as it did in NOD.H2h4 mice. We have shown that increased ICAM-1 expression is already present in baseline conditions (day 0 in Fig. 1⇑B), a time in which the hemopoietic infiltration is minimal. We have also shown that ICAM-1 expression increases with iodine administration concomitantly with an increase in the infiltrate. Thus, it was possible the effect of iodine on ICAM-1 was not direct, but rather a consequence of the infiltrating cells. To address this issue, we prepared primary thyrocyte cultures from 6-wk-old NOD-H2h4 mice, as previously described (26), and incubated them for 24 h with or without 0.01 mM NaI. As shown in Fig. 3⇓, iodine increased ∼3-fold ICAM-1 expression on thyrocytes, shifting to the right the median fluorescence intensity from 79 to 269 U. These findings indicate that iodine is capable of directly inducing ICAM-1 expression independent of the products released by the infiltrating lymphocytes. Iodine increases ICAM-1 expression of cultured thyrocytes. Single-cell suspensions were prepared from thyroids of five 6- to 8-wk-old NOD.H2h4, pooled, and placed in culture. NaI (0.01 mM) or control medium was then immediately added to the culture supernatant for 24 h. Cells were then collected, stained for CD54, and analyzed by flow cytometry. Iodine increased ICAM-1 expression 3-fold, from a median fluorescence intensity of 79 (filled histogram) to 269 (open histogram). Representative data from two different experiments. IFN-γ is typically found in the thyroids of patients with Hashimoto’s thyroiditis and NOD.H2h4 mice and is known to increase ICAM-1 transcription (27). We have previously reported transgenic mice that express IFN-γ specifically in the thyroid gland (16) and have shown that IFN-γ has a suppressive effect on autoimmune thyroiditis (17). We therefore wanted to assess whether iodine would overcome this suppressive effect of IFN-γ. Thyr-IFN-γ transgenics on the NOD.H2h4 background and wild-type NOD.H2h4 littermates were fed 0.15% NaI for 35 days. As shown in Fig. 4⇓ (•), CD45-positive cells began to infiltrate the thyroids of wild-type NOD.H2h4 on day 14 (p = 0.001 vs day 0) and continued to increase on days 28 and 35 (p < 0.0001 vs day 0). In contrast, only minimal infiltration was seen in thyr-IFN-γ transgenic littermates (○) on day 14 (p = 0.123 vs day 0), and overall also on days 28 and 35 the infiltration remained significantly lower than that seen in wild-type littermates. Regression analysis showed that, adjusting for time of iodine exposure, thyr-IFN-γ transgenics had 13% fewer CD45-positive infiltrating cells than wild-type controls (95% confidence interval from −16.3 to −9.8%, p < 0.0001). These results indicate that IFN-γ is capable of suppressing the thyroiditogenic effect of iodine. IFN-γ suppresses the iodine-induced accumulation of CD45+ hemopoietic cells into the thyroid. Thyr-IFN-γ transgenics on the NOD.H2h4 background and wild-type NOD.H2h4 littermates were fed iodine for 0, 14, 28, or 35 days. Thyroid glands were then collected and analyzed individually for the presence of CD45+-infiltrating cells. As expected (see Fig. 1⇑A), CD45+ cells significantly increased in wild-type NOD.H2h4 (•) upon iodine supplementation. Strikingly, this increase was mutated by IFN-γ (○). We finally asked whether IFN-γ and iodine together would influence ICAM-1 expression to a greater extent. Expression of ICAM-1 on thyrocytes before the start of iodine supplementation was similar in IFN-γ transgenics and wild-type controls, averaging in both groups around 5% (Fig. 5⇓, A and B, left). After 35 days of iodine supplementation, ICAM-1 expression increased to an average of 25% in wild-type controls. Strikingly, the increase was significantly more pronounced in IFN-γ transgenics where the average number of ICAM-1 expressing thyrocytes rose to 68% (Fig. 5⇓, A and B, right). These results indicate a positive (synergistic) interaction between iodine and IFN-γ on ICAM-1 expression (regression coefficient for the interaction term = 39.6; 95% confidence interval from 18 to 61%, p = 0.001). IFN-γ synergizes with iodine to increase ICAM-1 expression on thyrocytes. Thyr-IFN-γ transgenics on the NOD.H2h4 background and wild-type NOD.H2h4 littermates were fed iodine for 35 days. Thyroid glands were then collected and analyzed individually for CD54 expression. A, ICAM-1 increased slightly in wild-type controls after 35 days of iodine treatment. In contrast, the ICAM-1 increase at day 35 was pronounced in thyr-IFN-γ transgenics. 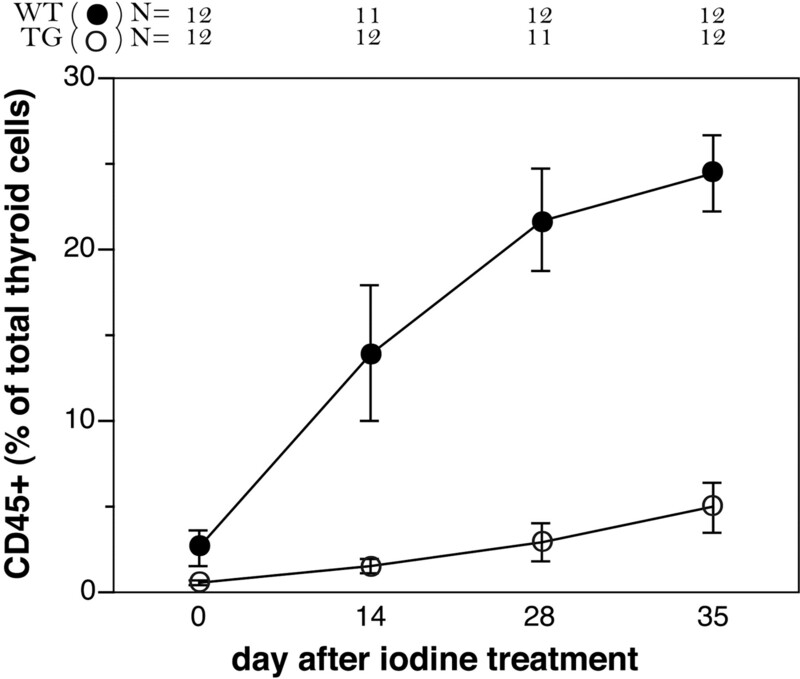 B, The mean ICAM-1 percentages in the two experimental groups (transgenics and controls) are shown to emphasize the synergistic interaction between iodine and IFN-γ, occurring after 1 mo of iodine supplementation. Lymphocytic infiltration of the thyroid gland, the hallmark of Hashimoto’s thyroiditis, involves a series of events dependent upon up-regulation of certain cell surface proteins such as the adhesion molecule ICAM-1, which mediates cell-cell interactions enhancing the inflammatory process (16, 19, 23). Several studies demonstrated increased ICAM-1 expression on the surface of thyroid cells in patients with autoimmune thyroiditis (20, 21, 28, 29, 30). This evidence, however, remains associative rather than causative because human findings are made only after disease is diagnosed, so that it is impossible to know whether the elevated expression of ICAM-1 precedes or follows the lymphocytic infiltration. Our investigations, using the NOD.H2h4 mouse, have helped to clarify this issue. We have in fact previously reported, using immunohistochemical methods, that NOD.H2h4 mouse thyrocytes constitutively express ICAM-1 and up-regulate it upon administration of excess dietary iodine (23). We now show more quantitatively by the use of flow cytometry that ICAM-1 is constitutively expressed on thyrocytes and define the kinetics of this expression at multiple time points. Furthermore, we show that this increased ICAM-1 expression is restricted to NOD.H2h4 and parental NOD strains, but not found in the BALB/c or C57BL6 strains. BALB/c mice, in addition, did not up-regulate ICAM-1 expression or develop AT upon iodine feeding, showing the necessity of genetic involvement in disease. Therefore, we have proposed that increased ICAM-1 expression is one of the major susceptible factors for disease induction. It remained unclear, however, from these in vivo experiments whether iodine increased ICAM-1 expression directly or by promoting infiltration of cytokine-secreting mononuclear cells. We therefore performed in vitro studies using cultured primary thyrocytes and showed that 24-h exposure to iodine directly up-regulates ICAM-1, inducing a 3-fold increase as compared with untreated cells. ICAM-1 is an inducible cell adhesion glycoprotein that is up-regulated in response to a variety of stimuli such as proinflammatory cytokines IL-1, TNF-α, and IFN-γ, viruses, and cellular stresses like H2O2. Each of these stimuli tends to increase ICAM-1 expression primarily by inducing gene transcription. The ICAM-1 promoter is complex, containing a large number of binding sites for inducible transcription factors (22). The major intracellular signal transduction pathways that regulate ICAM-1 expression include protein kinase C, JAK/STAT, MAPKs, and the NF-κB (22, 31, 32). Reactive oxygen species (ROS) can also activate ICAM-1 transcription. Interestingly, ROS, like superoxide anion and hydrogen peroxide, are generated in the thyroid during the process of iodine organification (33) and may contribute to increase ICAM-1 expression. Hydrogen peroxide is known to activate ICAM-1 transcription primarily through the MAPK pathway (34), and iodine may act through this pathway. Iodine could also influence the expression of ICAM-1 on thyrocytes by increasing hemopoietic infiltration and therefore the production of proinflammatory cytokines such as IFN-γ (16, 35, 36, 37). Therefore, we investigated the effect of iodine on ICAM-1 expression in thyr-IFN-γ transgenic mice, bred on the NOD.H2h4 background, that ectopically and specifically express IFN-γ in the thyroid (17). Our results demonstrate that iodine and IFN-γ synergistically interact to increase ICAM-1 expression. IFN-γ operates through the JAK/STAT signaling pathway and induces the formation of Stat1 homodimers that enter the nucleus and bind to IRE sequences on the ICAM-1 promoter (22). This pathway is different from that activated by iodine and acting through the induction of ROS, thus providing a molecular basis for the synergistic effect. Another interesting observation concerns the role of IFN-γ in thyroiditis induction and severity. In the mid-1990s, IFN-γ was considered the prototypical disease-promoting cytokine, because of its stimulatory roles of cell-mediated activities. We have previously shown that transgenic mice expressing IFN-γ in the thyroid do not develop spontaneous autoimmune thyroiditis (16) and are more resistant to the induction of experimental autoimmune thyroiditis (17). This disease-suppressive role for IFN-γ was present even despite the expression of high levels of MHC class II molecules on thyrocytes (38). We now report that IFN-γ, despite driving ICAM-1 expression to high levels in conjunction with iodine, is still capable of suppressing the lymphocytic thyroiditis observed in control littermates. A disease-suppressive function of IFN-γ has been reported in other disease models. Afanasyeva et al. (18) have shown that IFN-γ protects from disease in experimental autoimmune myocarditis, and Tarbell et al. (19) have shown a similar phenomenon in type 1 diabetes. Similar information has been generated in the infectious disease field. If mice lacking IFN-γ are infected with mycobacteria, there is a progressive expansion of T cells that is not attributable to increased numbers or persistence of bacteria (39). Similarly, after Listeria infection, the frequency of microbe-specific CD8 T cells is greater in IFN-γ knockout than in wild-type mice and the decline of T cells is delayed (40). Together these recent studies suggest that IFN-γ, in addition to being a principle effector cytokine of cell-mediated immunity, also plays a previously unsuspected role in the homeostatic control of T cells. We propose that, in a genetically susceptible host, iodine promotes the homing of autoreactive lymphocytes by inducing ICAM-1 expression. The cytokines produced by the infiltrating lymphocytes, then dictate the disease outcome with a plethora of effects on the function and the immunogenicity of the target organ. Among these effects there is immunomodulation, such as that exerted by IFN-γ. The NOD.H2h4 mouse is an ideal model to study the interaction between a well-documented environmental trigger, iodine, and the cytokines produced by the host, allowing further understanding of fundamental issues in disease pathogenesis. ↵1 This work was supported by National Institutes of Health Grants DK42174 (to C.L.B.) and DK55670 (to P.C.). ↵3 Abbreviations used in this paper: AT, autoimmune thyroiditis; ROS reactive oxygen species. Weetman, A. P., A. M. McGregor. 1984. Autoimmune thyroid disease: developments in our understanding. Endocr. Rev. 5: 309-355. Weetman, A. P., A. M. McGregor. 1994. Autoimmune thyroid disease: further developments in our understanding. Endocr. Rev. 15: 788-830. Canaris, G. J., N. R. Manowitz, G. Mayor, E. C. Ridgway. 2000. The Colorado thyroid disease prevalence study. Arch Intern. Med. 160: 526-534. Podolin, P. L., A. Pressey, N. H. DeLarato, P. A. Fischer, L. B. Peterson, L. S. Wicker. 1993. I-E+ nonobese diabetic mice develop insulitis and diabetes. J. Exp. Med. 178: 793-803. Rasooly, L., C. L. Burek, N. R. Rose. 1996. Iodine-induced autoimmune thyroiditis in NOD-H-2h4 mice. Clin. Immunol. Immunopathol. 81: 287-292. Braley-Mullen, H., G. C. Sharp, B. Medling, H. Tang. 1999. Spontaneous autoimmune thyroiditis in NOD.H-2h4 mice. J. Autoimmun. 12: 157-165. Bonita, R. E., N. R. Rose, L. Rasooly, P. Caturegli, C. L. Burek. 2003. Kinetics of mononuclear cell infiltration and cytokine expression in iodine-induced thyroiditis in the NOD-H2h4 mouse. Exp. Mol. Pathol. 74: 1-12. Tajiri, J., K. Higashi, M. Morita, T. Umeda, T. Sato. 1986. Studies of hypothyroidism in patients with high iodine intake. J. Clin. Endocrinol. Metab. 63: 412-417. Mahmood, S., M. M. Islam, N. I. Siddiqui, G. A. Hossain, R. K. Chakraborty, N. Akhter, I. Meah. 2004. Prevalence of antithyroid microsomal antibody in thyroid patients of endemic goiter area. Mymensingh Med. J. 13: 4-10. Sato, K., K. Okamura, T. Hirata, K. Yamasaki, H. Ikenoue, T. Kuroda, T. Mizokami, K. Inokuchi, M. Fujishima. 1996. Immunological and chemical types of reversible hypothyroidism; clinical characteristics and long-term prognosis. Clin. Endocrinol. 45: 519-528. Okamura, K., K. Sato, H. Ikenoue, M. Nakagawa, T. Kuroda, M. Yoshinari, M. Fujishima. 1994. Primary hypothyroidism manifested in childhood with special reference to various types of reversible hypothyroidism. Eur. J. Endocrinol. 131: 131-137. Yoon, S. J., S. R. Choi, D. M. Kim, J. U. Kim, K. W. Kim, C. W. Ahn, B. S. Cha, S. K. Lim, K. R. Kim, et al 2003. The effect of iodine restriction on thyroid function in patients with hypothyroidism due to Hashimoto’s thyroiditis. Yonsei Med. J. 44: 227-235. Kasagi, K., M. Iwata, T. Misaki, J. Konishi. 2003. Effect of iodine restriction on thyroid function in patients with primary hypothyroidism. Thyroid 13: 561-567. Rasooly, L., N. R. Rose, A. M. Saboori, P. W. Ladenson, C. L. Burek. 1998. Iodine is essential for human T cell recognition of human thyroglobulin. Autoimmunity 27: 213-219. Hamilton, F., M. Black, M. A. Farquharson, C. Stewart, A. K. Foulis. 1991. Spatial correlation between thyroid epithelial cells expressing class II MHC molecules and interferon-γ-containing lymphocytes in human thyroid autoimmune disease. Clin. Exp. Immunol. 83: 64-68. Caturegli, P., M. Hejazi, K. Suzuki, O. Dohan, N. Carrasco, L. D. Kohn, N. R. Rose. 2000. Hypothyroidism in transgenic mice expressing IFN-γ in the thyroid. Proc. Natl. Acad. Sci. USA 97: 1719-1724. Barin, J. G., M. Afanasyeva, M. V. Talor, N. R. Rose, C. L. Burek, P. Caturegli. 2003. Thyroid-specific expression of IFN-γ limits experimental autoimmune thyroiditis by suppressing lymphocyte activation in cervical lymph nodes. J. Immunol. 170: 5523-5529. Afanasyeva, M., Y. Wang, Z. Kaya, S. Park, M. J. Zilliox, B. H. Schofield, S. L. Hill, N. R. Rose. 2001. Experimental autoimmune myocarditis in A/J mice is an interleukin-4-dependent disease with a Th2 phenotype. Am. J. Pathol. 159: 193-203. Tarbell, K. V., M. Lee, E. Ranheim, C. C. Chao, M. Sanna, S. K. Kim, P. Dickie, L. Teyton, M. Davis, H. McDevitt. 2002. CD4+ T cells from glutamic acid decarboxylase (GAD)65-specific T cell receptor transgenic mice are not diabetogenic and can delay diabetes transfer. J. Exp. Med. 196: 481-492. Bagnasco, M., A. Caretto, D. Olive, B. Pedini, G. W. Canonica, C. Betterle. 1991. Expression of intercellular adhesion molecule-1 (ICAM-1) on thyroid epithelial cells in Hashimoto’s thyroiditis but not in Graves’ disease or papillary thyroid cancer. Clin. Exp. Immunol. 83: 309-313. Weetman, A. P., S. Cohen, M. W. Makgoba, L. K. Borysiewicz. 1989. Expression of an intercellular adhesion molecule, ICAM-1, by human thyroid cells. J Endocrinol. 122: 185-191. Roebuck, K. A., A. Finnegan. 1999. Regulation of intercellular adhesion molecule-1 (CD54) gene expression. J. Leukocyte Biol. 66: 876-888. Bonita, R. E., N. R. Rose, L. Rasooly, P. Caturegli, C. L. Burek. 2002. Adhesion molecules as susceptibility factors in spontaneous autoimmune thyroiditis in the NOD-H2h4 mouse. Exp. Mol. Pathol. 73: 155-163. Vladutiu, A. O., N. R. Rose. 1971. Autoimmune murine thyroiditis relation to histocompatibility (H-2) type. Science 174: 1137-1139. Caturegli, P., N. R. Rose, M. Kimura, H. Kimura, S. C. Tzou. 2003. Studies on murine thyroiditis: new insights from organ flow cytometry. Thyroid 13: 419-426. Jeker, L. T., M. Hejazi, C. L. Burek, N. R. Rose, P. Caturegli. 1999. Mouse thyroid primary culture. Biochem. Biophys. Res. Commun. 257: 511-515. Tandon, N., C. Dinsdale, T. Tamatani, M. Miyasaka, A. P. Weetman. 1991. Adhesion molecule expression by the FRTL-5 rat thyroid cell line. J. Endocrinol. 130: 451-456. Pesce, G., N. Fiorino, A. M. Riccio, P. Montagna, G. Torre, C. Salmaso, V. Altrinetti, M. Bagnasco. 2002. Different intrathyroid expression of intercellular adhesion molecule-1 (ICAM-1) in Hashimoto’s thyroiditis and Graves’ disease: analysis at mRNA level and association with B7.1 costimulatory molecule. J. Endocrinol. Invest. 25: 289-295. Weetman, A. P., M. Freeman, L. K. Borysiewicz, M. W. Makgoba. 1990. Functional analysis of intercellular adhesion molecule-1-expressing human thyroid cells. Eur. J. Immunol. 20: 271-275. Ciampolillo, A., G. Napolitano, R. Mirakian, A. Miyasaki, R. Giorgino, G. F. Bottazzo. 1993. Intercellular adhesion molecule-1 (ICAM-1) in Graves’ disease: contrast between in vivo and in vitro results. Clin. Exp. Immunol. 94: 478-485. Lockyer, J. M., J. S. Colladay, W. L. Alperin-Lea, T. Hammond, A. J. Buda. 1998. Inhibition of nuclear factor-κB-mediated adhesion molecule expression in human endothelial cells. Circ. Res. 82: 314-320. Chung, J., E. S. Park, D. Kim, J. M. Suh, H. K. Chung, J. Kim, H. Kim, S. J. Park, O. Y. Kwon, H. K. Ro, M. Shong. 2000. Thyrotropin modulates interferon-γ-mediated intercellular adhesion molecule-1 gene expression by inhibiting Janus kinase-1 and signal transducer and activator of transcription-1 activation in thyroid cells. Endocrinology 141: 2090-2097. Sugawara, M., Y. Sugawara, K. Wen, C. Giulivi. 2002. Generation of oxygen free radicals in thyroid cells and inhibition of thyroid peroxidase. Exp. Biol. Med. 227: 141-146. Bundy, R. E., G. S. Hoare, A. Kite, J. Beach, M. Yacoub, N. Marczin. 2005. Redox regulation of p38 MAPK activation and expression of ICAM-1 and heme oxygenase-1 in human alveolar epithelial (A549) cells. Antioxid. Redox. Signal 7: 14-24. Tang, H., G. C. Sharp, K. Chen, H. Braley-Mullen. 1998. The kinetics of cytokine gene expression in the thyroids of mice developing granulomatous experimental autoimmune thyroiditis. J. Autoimmun. 11: 581-589. Yu, S., G. C. Sharp, H. Braley-Mullen. 2002. Dual roles for IFN-γ, but not for IL-4, in spontaneous autoimmune thyroiditis in NOD.H-2h4 mice. J. Immunol. 169: 3999-4007. Shong, M., H. K. Ro, Y. K. Kim, C. J. Yoo, J. H. Lee, C. U. Song, B. Y. Cho. 1994. The cytokines, interleukin-1β, interleukin-6 and interferon-γ upregulate the expression of intercellular adhesion molecule-1(ICAM-1) in rat thyroid cell line, FRTL-5. Korean J. Intern. Med. 9: 88-92. Kimura, H., M. Kimura, W. H. Westra, N. R. Rose, P. Caturegli. 2005. Increased thyroidal fat and goitrous hypothyroidism induced by interferon-γ. Int. J. Exp. Pathol. 86: 97-106. Dalton, D. K., L. Haynes, C. Q. Chu, S. L. Swain, S. Wittmer. 2000. Interferon γ eliminates responding CD4 T cells during mycobacterial infection by inducing apoptosis of activated CD4 T cells. J. Exp. Med. 192: 117-122. Badovinac, V. P., A. R. Tvinnereim, J. T. Harty. 2000. Regulation of antigen-specific CD8+ T cell homeostasis by perforin and interferon-γ. Science 290: 1354-1358.